Uttar Pradesh Chief Minister Akhilesh Yadav feels the days of caste-based politics in the state are over and now the two Ds -- development and demonetisation problems – will work in favour of the Samajwadi Party in the upcoming assembly polls. According to him, his family feud is no more a factor and all issues have been changed post demonetisation. "That is a thing of past now. We are working together to win the elections. Issues have changed and post demonetisation nobody remembers that (family feud) now. All the other issues have been left behind and demonetisation has emerged as the key issue," he said. He asserted that Uttar Pradesh will vote for his work, image and not on caste equations. "Our work in last five years and the problems people are facing due to demonetisation will lead us to victory in upcoming elections. Jo kataarein ATM ke bahar lagi hai wo polling booth ke bahar lagegi (polling booths will see long queues like the ones outside ATMs now)," Akhilesh told PTI in an interview. When asked who he considers the bigger rival -- the Bharatiya Janata Party or the Bahujan Samaj Party, he said people of Uttar Pradesh have lost faith in both of them. "The BJP has done nothing for Uttar Pradesh in last two and a half years. The prime minister was elected from UP, the home minister and the defence minister are also representing UP. They have maximum number of MPs from UP but they have given nothing to the state apart from Adarsh Gaon Yojna and nothing is happening on that front also,” he said. "As far as the BSP is concerned, people are not interested in getting elephants installed everywhere," he added. His father and SP supremo Mulayam Singh Yadav has already ruled out any pre-poll alliance with Congress but Akhilesh said it will be premature to predict anything as of now. "Of course the party president will take a call on that but I believe that we will get 300 plus seats if we enter into a pre-poll alliance with Congress. I know that netaji (Mulayam) has said there will be merger, no alliances but there is still time for the elections and you must wait and watch. Politics is full of surprises and you never know what will happen tomorrow," he said. "I do not have any doubt on getting an absolute majority but we can get 300 plus seats if we fight together. Samajwadis believe that Congress is their best friend when it is weak," he said. The SP had gained absolute majority in 2012 winning 224 seats. The BSP had won 80, the BJP 47 and Congress 28. Akhilesh does not believe there is too much focus on Muslim voters. "If I am talking about development, they (Muslims) should also get benefited by it. I am giving them their right. If we explain this, nobody will have any objection. Those who want to do communal politics will not be successful in UP. Politics has changed and it is no more based on caste equations," he asserted. "People are connected through media and social media and they are aware of what is happening in the world. They want politics of development and ‘positivity’, not of hatred," he added. On the law-and-order issue, he said he is leaving no stone unturned to restore faith of the people. "I have sent my teams to New York, Singapore and Houston to study their police system. We have also started 'dial 100 scheme' which will be implemented in a phase-wise manner." On party tickets, he said, "Ticket distribution is not in my hand. I can only give my suggestions and will do that. Everyone is aware of my views on that. National president of the party will take a call on that," said Akhilesh, who stayed away when his father launched the party’s poll campaign last month from a stronghold of the erstwhile Quami Ekta Dal, led by Mukhtar Ansari. He had opposed the merger of the QED with his party but Mulayam and uncle Shivpal Yadav overruled the young chief minister later. 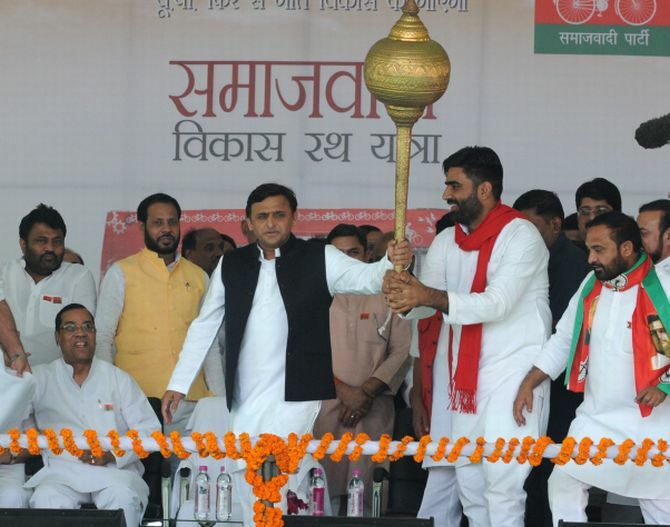 Asked whether he got a 'free hand' to work during his tenure, Akhilesh said he feels more matured and experienced now. "Last time I was new in politics and became chief minister with the blessings of netaji. I am more matured and with age I have also gained experience. I have fulfilled all the promises I had made in my manifesto. I have initiated schemes on which Samajwadis can do politics for next 10-15 years. In my next innings I will work harder to make UP number one state," he said.